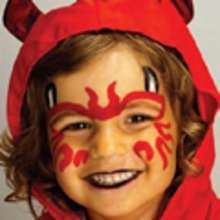 Using a brush and black paint, create a spider web on the right cheek. Do this by crossing 3 straight lines to create a star shape and then linking each of the lines with 2 curved lines in each segment. 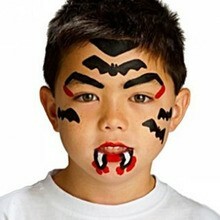 Using black color and the brush, draw a spider on the left cheek. Use a circle as the body and a smaller circle for the head. Add 4 legs to either side of the body and 2 antennae to the top of the head. With bright red color, draw a tripe along each leg and the antennae. For the finishing touch, add silver color to the web. You look like a cute little terror now!